A guide to homes and lifestyle in the beach towns of Pinellas County, FL. In south Pinellas County, FL we have around 25 miles of white sand beaches between Clearwater Beach to the north and St. Pete Beach to the south. On these islands you'll find the beach towns (north to south) of Clearwater Beach, Belleair Beach, Indian Rocks Beach, Indian Shores, Redington Shores, North Redington Beach, Redington Beach (collectively "The Redington Beaches), Madeira Beach, Treasure Island, and St. Pete Beach (including Pass-A-Grille). These ten towns make up one of the most unique areas in the country, sometimes referred to as the Tampa Bay Beaches." One thing that makes the area so unique is that each town has its own personality. Some are more commercial, some more residential, some more interesting to real estate investors and those looking for vacation condos, others perfect for snowbirds. When looking for real estate at the beaches it can be tough to narrow down which area best suits ones needs. Hopefully this guide will help point you in the right direction. High-end waterfront homes and condos, vacation condos, popular with tourists. The north end of the Pinellas barrier islands is anchored by Clearwater Beach where you'll find many restaurants, hotels and activities geared toward vacationers. The Beach Walk area along the beach was completely redeveloped in 2008, adding wide paver walkways, benches, and nice lighting for late strolls along the Gulf. Every night from 6-10 PM there is a sunset celebration called Sunsets at Pier 60 where you can enjoy entertainment, arts, crafts and more. Many more festivals, fairs and events are held all year long. At the Clearwater Beach Marina you can find numerous boats offering tours of all kinds, from fishing to pirate ships to sunset sails. of high-rise, high-end, resort style condo developments. You won't find a lot of amenities on Sand Key, other than a large strip mall and the Columbia Restaurant. People residing in Sand Key will often take a trolley or cab over the bridge to Clearwater Beach for restaurants, shopping and entertainment. Homes in Clearwater Beach are found in three distinct neighborhoods: Island Estates, an area of mostly single-family homes located off of the Clearwater Causeway; Clearwater Beach, where you will find luxury condos as well as single family homes, many fronting the Gulf of Mexico; and Sand Key, which primarily consists of high-rise luxury condos. Quiet area, high-end homes. Belleair Beach has the reputation of being an upscale, quiet area. While you won't find a lot of amenities in this small town other than a boat ramp, fishing pier and park, its just a quick trip north to Clearwater Beach, or south to the restaurants and bars of Indian Rocks Beach. Homes in Belleair Beach can be divided into Belleair Shore, where you will find 55 luxury, Gulf-front homes (or mansions), and Belleair Beach, which offers single-family homes on the bay side, and condos and single-family homes on the Gulf side. Vacation condos, waterfront homes, many restaurants and bars. Indian Rocks Beach is one of Florida's best kept secrets and, while popular with tourists, also has a strong local scene. Other than the more commercial town of Clearwater Beach and St. Pete Beach, Indian Rocks Beach has more bars and restaurants than any of the other beach towns. A major road reconstruction was completed in 2009, adding separate bike and walking lanes on each side of Gulf Blvd., making walking or biking to local establishments both easy and common. The Indian Rocks Beach Homeowners Association is very active, organizing many events and festivals throughout the year. Homes in Indian Rocks Beach range from quaint Gulf-front condos to luxury waterfront homes on the bay. Minimum rental rules are more relaxed than in other areas, making this a popular area for investors looking for vacation rental properties. Vacation condos, popular with tourists. Indian Shores shares a lot of similarities with Indian Rocks Beach, though with less of a local feel and more popular with tourists due to the large number of vacation condos. Indian Shores benefited from the same 2009 road construction project as Indian Rocks, adding separate walking and biking lanes to each side of Gulf Blvd. Beach access is easy with crossings located at regular intervals along Gulf Blvd. While offering fewer restaurants than Indian Rocks, there are still several great options, including Salt Rock Grill, one of the Tampa Bay area's best and most popular restaurants. Homes in Indian Shores consist primarily of waterfront condos on the Gulf and Bay side. Rental rules are relaxed, making this another area very popular with inventors. Quiet, residential, longer-term rentals, Gulf-front homes. The Redington Beach area, which actually consists of the three separate towns of Redington Beach, North Redington Beach, and Redington Shores, is located on the barrier islands about midway between Clearwater Beach and St. Pete Beach. A quiet, mostly non-commercial area, you will find a great boat launch facility, some shops, and popular restaurants including The Conch Republic and The Wine Cellar. The Doubletree Beach Resort is very popular with vacationers. The beaches in Redington Beach are wide, soft and beautiful. If you like to fish the Redignton Long Pier is a popular spot, offering gear rental and bait sales. Homes in Redington Beach consist primarily of waterfront and Gulf-front single family homes, and Gulf-front condos. Redington Towers is the largest condo development, its three separate towers dominating the skyline of Redington Shores. Redington Beach proper has no Gulf-front condos but features almost two miles of large, Gulf-front single-family homes, as well as many waterfront homes on the bay side. Popular with tourists, vacation condos, waterfront homes and John's Pass Village. Madeira Beach is primarily a vacation destination, though there are many permanent residents as well. The beaches are wide, soft and great for walking and there are many options for dining and entertainment. Many people associate Madeira Beach with John's Pass Village. Touted as a "fishing village" the complex is located directly on the John's Pass outlet to the Gulf of Mexico and features many restaurants, shops and entertainment. Very popular with tourists, here you can rent Jet Skis or a boat, catch a fishing tour, take a ride on a pirate ship, or even head out to sea for an afternoon or evening of gaming on the Trade Winds Casino Cruise Ship. Homes in Madeira Beach consist primarily of Gulf-front condos on the beaches and waterfront homes on the Gulf side. Residential homes and condos, strong local scene, longer-term rentals. Everyone loves Treasure Island (TI to the locals), which can be found just over the John's Pass Bridge from Madeira Beach. Though primarily a residential area, there are some hotels and condo-hotels where you can stay short-term, and the condo development of Land's End which allows weekly condo rentals. Sunshine Beach features one of the widest beaches in Pinellas County. Great for shelling, but not as easy on the feet as other areas, this huge beach is popular with walkers, kiters, kite surfers and para-gliders. The city of Treasure Island is very active in planning events during the year including concerts, sand sculpture contests, the Christmas Boat Parade and many other festivals and fairs. Homes in Treasure Island are divided into the neighborhoods of Paradise Island, Isle of Capri, Sunshine Beach, and Sunset Beach. The majority of homes in Treasure Island are single-family homes, but there are plenty of condos mixed in as well. A very popular condo development is Mansions By The Sea, its two towers being one of Treasure Island's most recognizable landmarks. Vacation resorts, waterfront homes, beach bars. St. Pete Beach anchors the barrier islands at the south end. The city can be divided into three distinct areas: North St. Pete Beach, beginning at Blind Pass and ending at the Corey Causeway; Central St. Pete Beach, beginning at the Corey Causeway and ending at the Pinellas Bayway and Don Cesar Hotel; and Pass-A-Grille, a peninsula at the south end of St. Pete Beach. St. Pete Beach attracts the most tourists of the beach towns and accordingly has the highest number of hotels, resorts, restaurants and beach bars. Some of the more popular resorts include Trade Winds Island Resorts, Sirata Beach Resort, and the Lowes Don Cesar Hotel. You will also find many smaller resorts and hotels lining Gulf Blvd. The beaches are very wide with soft, white sand, and you'll find loads of people enjoying them most days of the year. Stand Up Paddle Boarding is the newest growth sport in the area, and you can find many places to rent a board for the hour or for the day. After a day on the beach there are multitudes of great restaurants to enjoy including one of our favorites, Snapper's. After dinner you might enjoy a sunset sail out of Dolphin Landings. The city is not just for tourists however. Homes in St. Pete Beach run from small condo-hotels to huge, luxury waterfront homes. 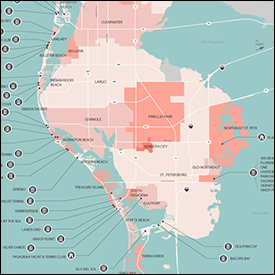 Interestingly, St. Pete Beach protects its tourist industry with a city-wide 90-day minimum rental period on private properties. This makes the city less popular with investors since they are not permitted to offer short-term rentals. Homes in St. Pete Beach vary depending on the area. On the north end of St. Pete Beach you will find mostly condos, including what is probably the largest and most recognizable developments - St. Pete Yacht and Tennis Club. There are also a number of waterfront properties located directly on Blind Pass. Since Blind Pass runs the entire distance of north St. Pete Beach there are no beaches in this area. To get to the Gulf of Mexico you'll have to go north over the bridge to Treasure Island or south to Upham Beach in St. Pete Beach. Pass-A-Grille on the south end is a unique area, almost a different town in itself. Homes in Pass-A-Grille consist of large, waterfront homes on the Gulf-of-Mexico and bay side, and many small bungalow style homes in the interior. You can also find a number of small condo properties scattered throughout. We hope this brief guide helped give you a better feel for the ten beach towns of Pinellas County. Perhaps the next time you are in town you can take an afternoon drive down Gulf Blvd. and see for your self how each of these towns has their own personality. You will be rewarded with some great views, water around every corner, and meet some interesting people if you take the time to get out and walk around. Of course, when you are ready to get out and see some homes or condos, just call, email or text message us any time and we'll get you started.